NC1945, Ship 386 is a rare eight-window, 24 passenger version and was one of the few DC-3s to not be converted for military use during WWII. 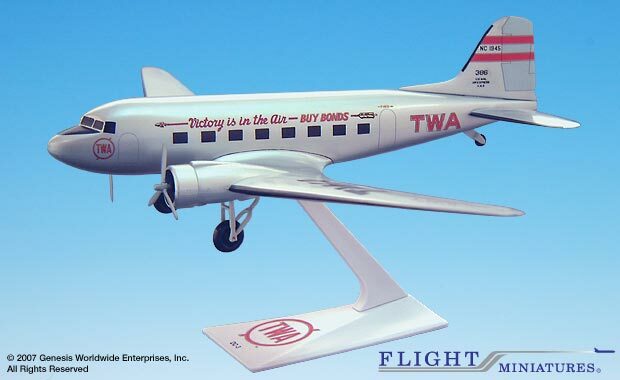 It was delivered to TWA on February 28, 1941 and operated by TWA until 1952. This DC-3 spent the next 14 years with North Central Airlines. In 1968 it went into charter operations, and was a travel club airplane with Coronado Airlines in California. The airplane ended its service as an electronic test bed. In 1993 the aircraft was purchased by the Airline History Museum at Kansas City and has undergone a complete restoration. The goal for the DC-3 is to fly it to air shows and preserve the history of propeller-driven commercial aircraft. More information about this aircraft can be found at www.airlinehistorymuseum.com.